The Boston Celtics have champagne problems. After winning the NBA’s draft lottery on Tuesday night, via a Brooklyn Nets picks swap, they must decide who they’re going to select or for whom they’ll trade their spot. Ainge on No. 1 pick: "It's going to be a tough choice for us." 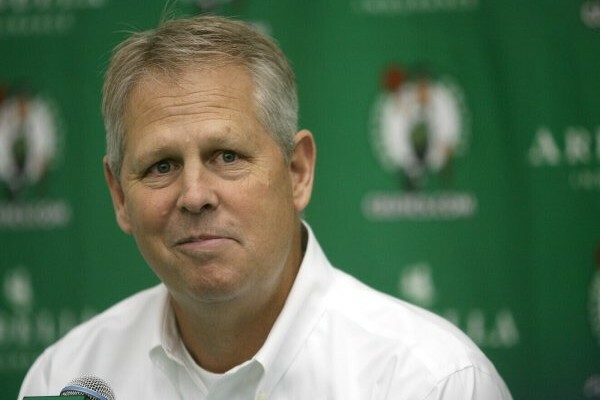 Danny Ainge: It was hard to hold onto the pick at the trade deadline. It was tempting. Proponents of the “Go for it now!” stance will want the Celtics to dangle this pick, perhaps the 2018 Nets selection and whatever else it takes to land Jimmy Butler or Paul George. And there is merit to that slant. But the Celtics also have to take into account of where they stand relative to the rest of the league’s foremost contenders. Does Butler or George give them a legitimate chance against the Cleveland Cavaliers? And if so, will that chance extend to the Golden State Warriors, San Antonio Spurs and Houston Rockets out west? Boston will get some answers during the Eastern Conference Finals. Stick close to Cleveland, and that’s enough to push all your chips into the center of the table. Fall without genuinely rivaling the reigning champ, though, and the Celtics might be better off holding on to their picks, opting to develop prospects and bide time until Cleveland’s and Golden State’s windows fade. The latter is the more sensible play, since you must figure LeBron James’ Cavaliers and the Warriors have at least a few years of dominance left in them. But with Avery Bradley, Marcus Smart and Isaiah Thomas all slated for raises by 2018-19, and with Al Horford’s clock ticking, the Celtics may decide they have no choice except to placate the go-for-it-now supporters.